Every dog deserves the extra love on their birthday of a simple homemade dog cake baked by their pet parents. 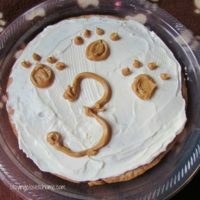 Our golden retriever, Chloe, turned 3 last week, , so I decided to make her this homemade dog cake recipe. A dog cake recipe? Yes! We believe in having fun and including Chloe, and this was a fun and silly way to celebrate her life. If you have been reading this blog at all, you know she is one of the family and we often will pick travel destinations so we can bring her along. 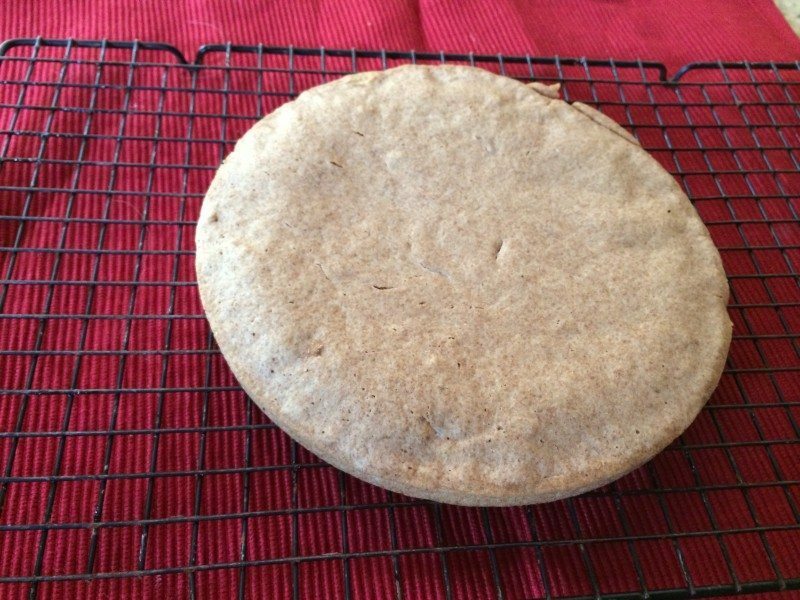 While she is not new to homemade dog treats and homemade doggie cakes, I picked a new homemade dog cake recipe to try for this birthday. No dog party this year. We just stopped over at her boyfriend’s house and shared a slice of our dog cake. I adapted the dog cake recipe I found on Allrecipes.com and came up with this smaller version for the two dogs. The cake takes no time to make and I made it the day before just knowing we had a busy day planned on her birthday. Simply mix together the dry and wet ingredients in a bowl and place in a greased pan. For half a recipe we used a 9 inch round cake pan. Simple, right? 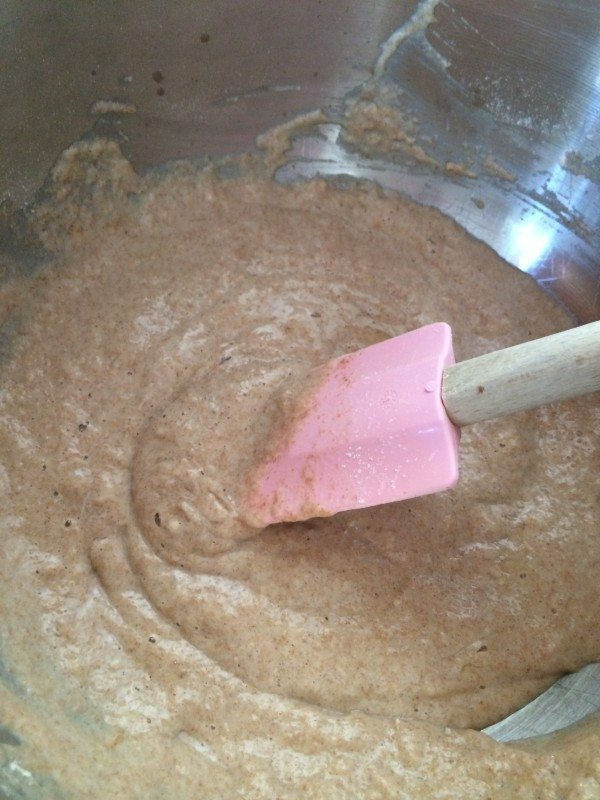 Bake the cake until it is brown in color. Our cake actually shrank from the sides of the pan. You could easily turn this dog cake recipe into dog cupcakes instead if you had multiple dogs to feed at a dog birthday party. Double the batch and make it a dog layer cake! 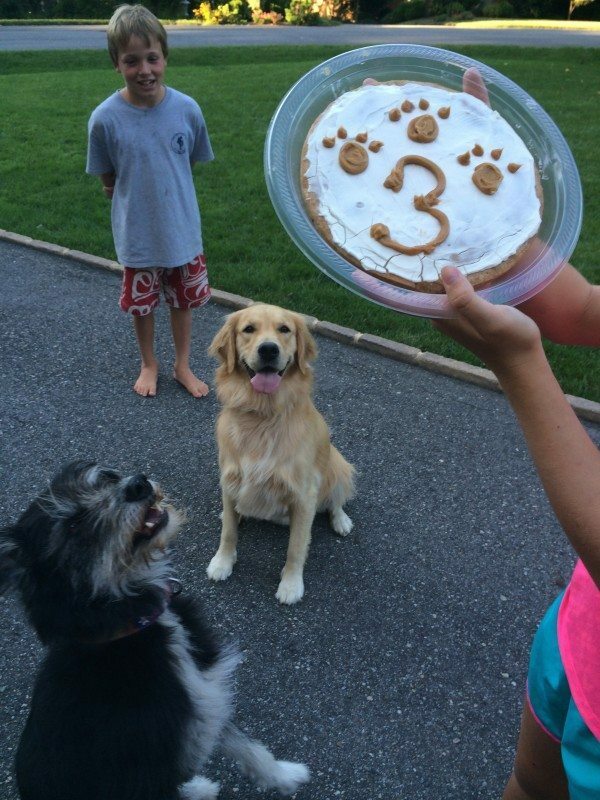 Whatever method you choose, we just now your dog, like Chloe, will love the special birthday treat! Allow to cool and then frost. 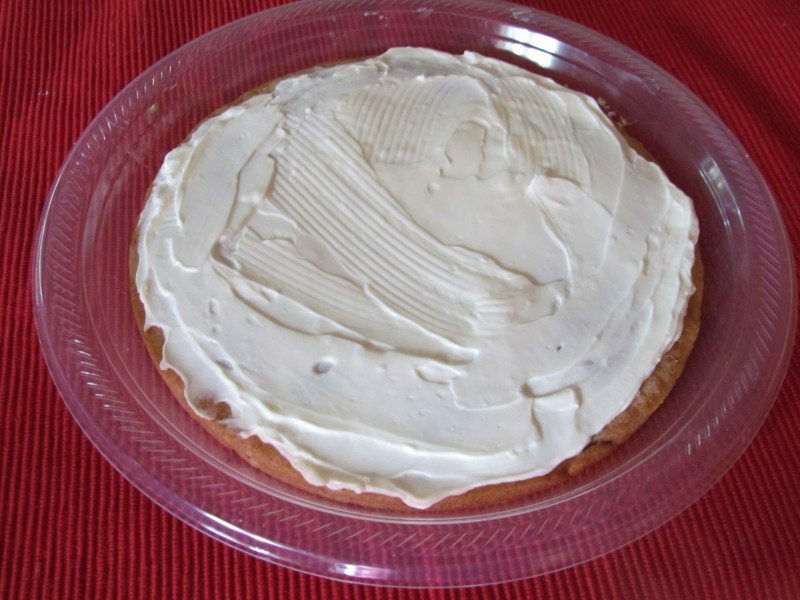 I used cream cheese and Greek yogurt (low fat for both) for our frosting and then decorated with peanut butter. 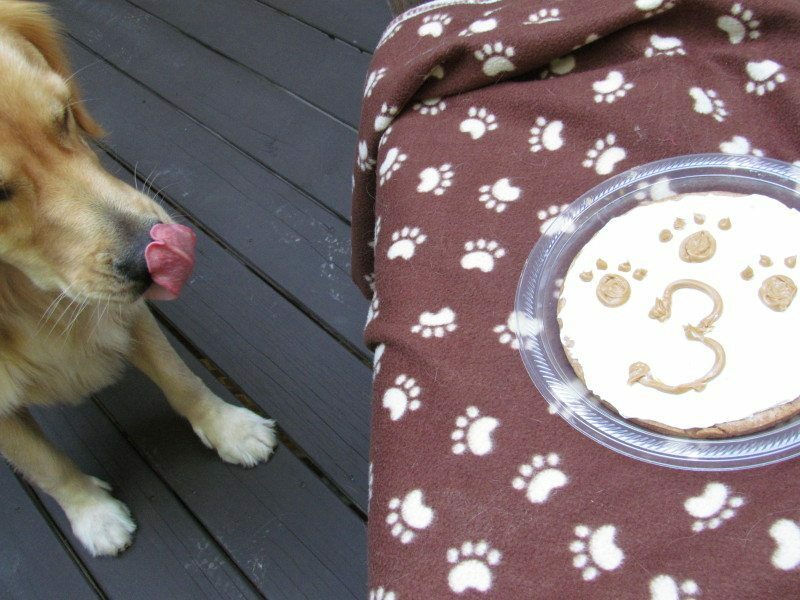 All dogs love peanut butter, and this dog cake recipe was perfect for our favorite pups! Cream cheese, Greek yogurt, and peanut butter. Mix all ingredients well. Pour into baking pan that has been sprayed or coated with oil. Blend together room temperature fat free cream cheese (4 oz) & 2 Tbs skim milk (we used greek yogurt) until a spreadable consistency and frost cake. 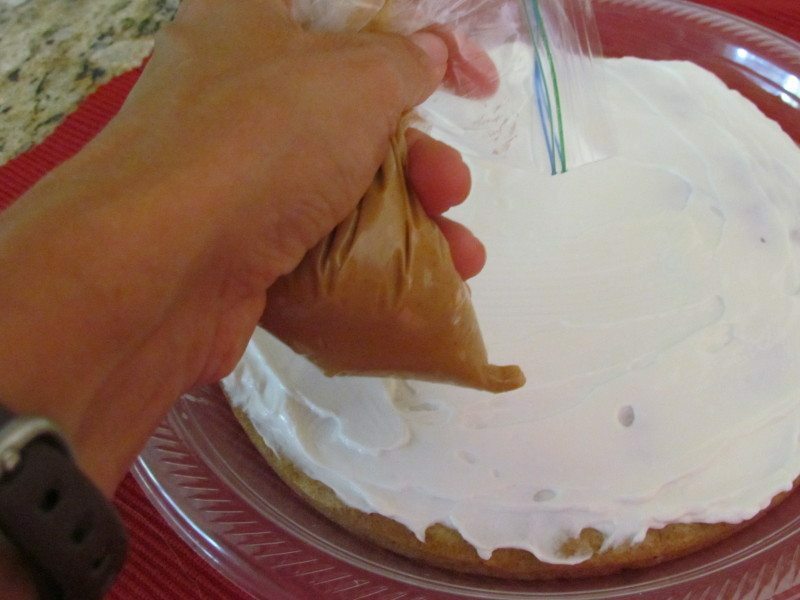 Add peanut butter to a sandwich size Ziploc bag and decorate the cake. You can refrigerate or serve immediately. I had a curious bystander during the photo shoot. She sure was anxious to try some of this dog cake recipe! Check out that tongue. I bet she can smell the peanut butter already! For her birthday, all dogs were very interested and both gobbled the piece of cake. That is not unusual for Chloe but Wilson eats slower, but not today. When dogs get excited they tend to try to grab at treats, so be careful when showing them this if you aren’t ready for them to enjoy it! Don’t forget to add some party hats, a fun streamer, and of course some new dog toys to the mix! A homemade dog cake recipe is just what you need to make your pet birthday even more special. Have fun decorating, and of course bump up the flavor with their preferences. 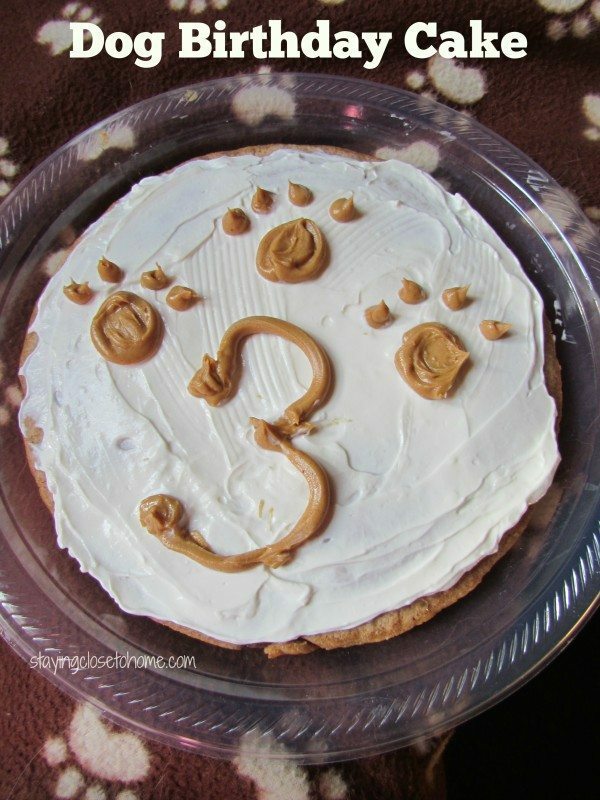 Most dogs love peanut butter as a topping for their homemade dog cake! thanks for linking up this post to your blog. send met he URL and I would be happy to promote it as well. How cute! I’m going to have to try that!